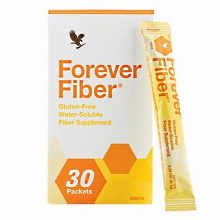 Forever Fiber is a convenient way to increase our overall daily fiber intake and optimize our health. 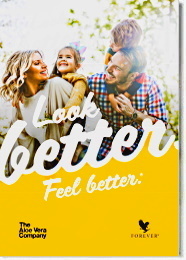 It is a proprietary blend of four types of fiber, and offers a convenient way to add some extra fiber to our diet, by sprinkling on the foods we eat, mixing with Forever's Aloe Vera Gel or other beverage, or adding to our water bottle when we are on the go. 5 grams of fiber per stickpack. Designed to provide a convenient way to support optimal fiber intake. 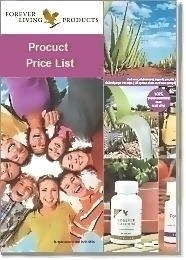 Readily dissolves in water, Aloe Vera Gel, or other beverages. Quick-dissolving, mild-tasting, grit-free, and gluten-free. Dietary fiber has been shown to support cardiovascular function and, of course, because scientists now recognize that up to 70% or 80% of immune function in the body is associated with the gastrointestinal tract, fiber may help to support the immune system via its benefits for digestive function. Adequate soluble fiber intake can facilitate removal of waste products from the body and may help to relieve occasional constipation. Experts recommend that we consume up to 30 grams of fiber daily for optimal health and digestive function, yet sadly, most people only consume approximately half that amount. Our search for convenience in the foods we eat, means that we aren’t obtaining the adequate amounts of fiber that we need to support our health. Forever Fiber makes it easy to add more fiber to our diet by providing 5 grams of quick-dissolving soluble fiber in each convenient stickpack to support a healthy diet. That is the equivalent of almost 1 ½ cups brown rice or 2 slices of whole wheat toast – without the carbohydrates and calories. While we often associate fiber with supporting digestive function, and this is certainly very true, fiber provides significant benefits to the body overall. Forever Fiber, taken between meals, can help to support feelings of fullness, thereby controlling appetite and cravings, and caloric intake. This is especially important for those on a weight management program, when used with a healthy diet and regular exercise. By also helping to support normal blood sugar levels already in the normal range, and slow the absorption of macronutrients from our foods, fiber can also help limit feelings of sluggishness or low energy after we eat. Mix one stickpack with water, Forever's Aloe Vera Gel, or other beverage, daily. It is suggested to take Forever Fiber at least 30 minutes away from other dietary supplements as fiber may impact their absorption in the body.